Love’s Fowlis a miniature grand opera about the life and adventures (mostly amorous) of La Pulcina Piccola (Chicken Little), a larger-than-life bird. The story begins with the familiar "sky-is-falling incident," when an acorn falls on her head and she leads her barnyard friends to tell the king of the impending disaster. It goes on to explore her eventful life including forays into politics and the theatre (where she triumphs as Richard III), and--always, always--romance. A grandly life-embracing and life-affirming character, La Pulcina Piccola's approach to life is: enjoy today, for the sky may fall tomorrow. "Chicken Little, star of an opera performed with dressed-up Styrofoam balls, sung in Italian, which makes grown men cry." 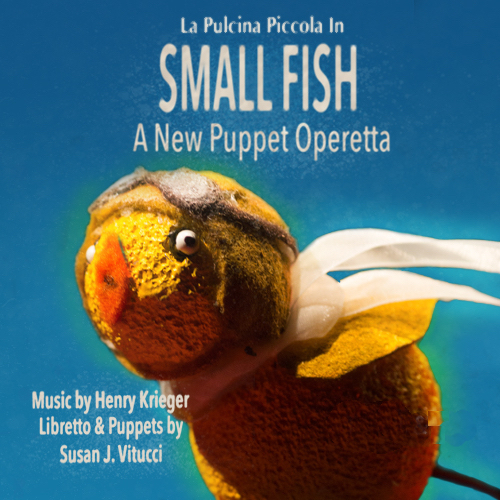 Currently in development, SMALL FISH is a full-length puppet operetta with a score by Henry Krieger and libretto and puppets by Susan J. Vitucci. It stars the puppet diva La Pulcina Piccola (Chicken Little), the bravest, boldest most daring chicken that ever lived, who travels to the ends of the earth and beyond in the adventure of a lifetime. Description to follow. Click here to learn more.